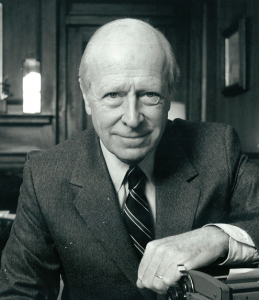 November 21, 2015 – Austin H. Kiplinger ‘39, a Washington publisher, civic leader and philanthropist who sustained the growth of his family’s media empire and whose interests ranged from raising wheat to collecting memorabilia of the city’s history, died Nov. 20 at a hospice in Rockville, Md. The cause was cancer. He was 97. Nicknamed “Kip” he was the son of a prominent journalist-entrepreneur and the father of two others. After an early career as a reporter and broadcast news commentator, he joined the family business and oversaw its steady expansion. Kiplinger Washington Editors, founded in 1920 by his father, Willard M. Kiplinger, included business and economics forecasting publications that carried great influence. Kip led the company for more than three decades as president or chairman. A dapper, poised and highly sociable man with a ready smile and a mellifluous baritone, Kip was a fixture on the Washington black-tie social scene. Kiplinger was a relentless volunteer for boards. He chaired the Tudor Place Foundation, which operates a historic property in Washington’s Georgetown neighborhood, and served on boards of institutions including the private Landon School in Bethesda, Md., the National Symphony Orchestra and the Washington International Horse Show. He was a founder and board member of his family’s Kiplinger Foundation, known for its support for local arts and culture. Kip maintained a large collection of Washingtoniana and donated much of it to the Historical Society of Washington, D.C. Brother Kiplinger was a benefactor of Cornell University, where he graduated in 1939 and served on the board. He was chairman emeritus (1984-89). He had been a presidential councillor since 1989. “Kip has not only given his life to Cornell, he’s given his fortune to Cornell,” former President Frank Rhodes said not long ago. Besides his lifelong support for the Cornell Delta Upsilon Association, Kip made contributions across campus: the Kiplinger chair in economics; his support of the Schwartz Center for the Performing Arts (which includes the Kiplinger Theatre); his role as co-chair in the effort to renovate and expand Lincoln Hall; his role in supporting student aid in challenge grants and leadership roles; and his work as a member of the administrative board of the Lab of Ornithology. 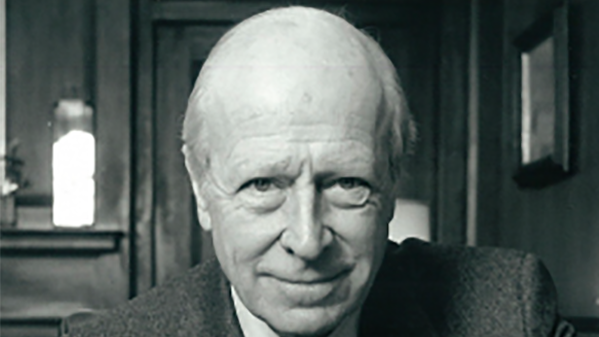 Austin Huntington Kiplinger was born in Washington on Sept. 19, 1918. He began his journalism career in 1940 as a reporter for the San Francisco Chronicle. After serving in World War II as a Navy aviator, Kip helped his father start the company’s personal finance magazine, now known as Kiplinger’s Personal Finance. Kip was then a news commentator in Chicago for ABC and NBC before his father beckoned him back to the family business in the mid-1950s as executive vice president.